PS: IKEA fessed up to the error of the ways, and I’ve accepted £4.50 from them as recompense and to punish them for their sins. 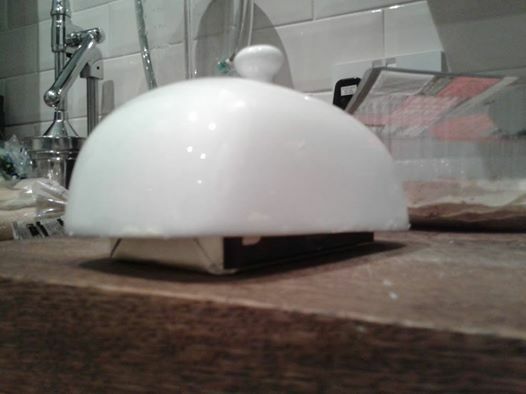 we bought a butter dish from your shop and the lid’s too small to fit any standard UK butter pack. You can see on the attached picture that the lid or cover or dish-hat or whatever it is sits atop the butter like a lampshade, it’s like the butter’s trying to hide or something. I’d like a refund please. No I don’t. Why should I only be able to complain about your bizarre products on pain of being blitzed with demands from you to buy more of them? But if I’m sending you an email, you demand the right to save my personal information. So I can only email you to say delete this personal information if I agree to you saving it again? It’s as duplicitous as your shop floor layout and as suspicious as the butter in the picture above. I tell you now, do not contact me with any marketing information and do not share my information with anyone. ← I HAVE THE BLOG!!!! !